150 of us started out from a terrible place under an angry sky. We rode as strangers, as friends, and as families. We climbed, we sweated, we fell, and we flew. We thought about those who never left that terrible place. And in the end, we arrived. 150 of us together, under a blue sky, strangers no more, having made a journey that took us farther than the miles we rode. Welcomed into a place that has become for many a home; close to that terrible place but at the same time far, far away. 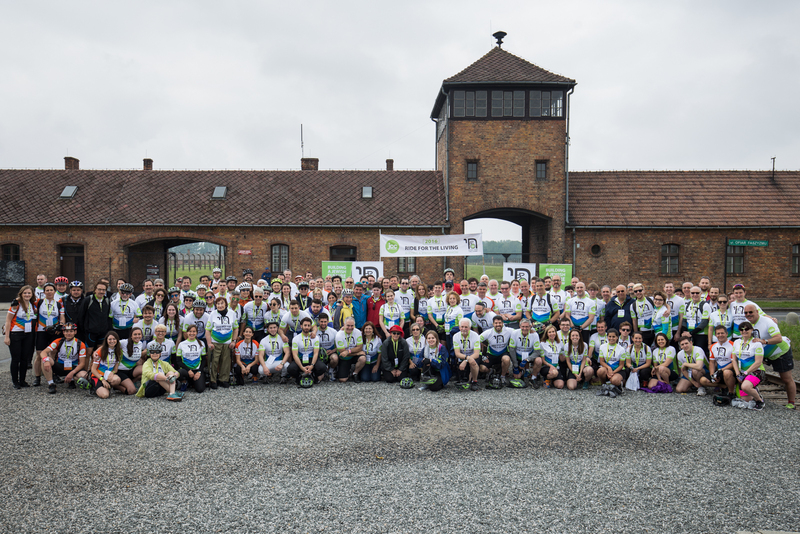 The Third Annual Ride For The Living, an event in which over 150 participants cycled 55-miles (90 km) from the gate of Auschwitz-Birkenau to the Jewish Community Centre of Krakow, was held on June 3, 2016. The aim of Ride For The Living is to honor victims of the Holocaust while celebrating the renewal of contemporary Jewish life in Poland today. This year’s Ride For The Living was led by the Chief Rabbi of Poland Michael Schudrich, and participants included the U.S. Consul General of Krakow Walter Braunohler, representatives from Friends of JCC Krakow, World Jewish Relief, and UJA Federation of New York. Riders represented many nations including the United States, United Kingdom, Poland, Ukraine, Colombia, Canada, South Africa, the Netherlands, and Israel. The journey was more than a symbolic ride; for some it was an emotional and life-changing event. Marcel Zielinski, an 81-year-old Auschwitz-Birkenau survivor, joined Ride For The Living for the 2nd time with his wife and son. Marcel cycled along the same route that he walked as a 10-year-old child to Krakow in search of his family after being liberated from Auschwitz-Birkenau in 1945. The Executive Director of JCC Krakow, Jonathan Ornstein, rode a tandem bike with JCC Senior Club member and 81-year-old Holocaust survivor Zofia Radzikowska who had never before ridden a bike. She stated that her father purchased and refurbished a bike for her as the Nazis invaded Poland but she never had had the chance to ride it. The JCC Association of North America held twelve satellite Ride For The Living programs at JCCs around North America for those who were unable to travel to Poland to participate. These JCCs hosted corresponding events such as spin or cycling classes in which participants cycled virtually alongside the Riders in Krakow and learned about the renewal of Jewish life in Poland. In addition, a 55-mile bike ride was held in Los Angeles on June 5th. The riders began their round-trip journey at the Holocaust Museum, cycled to the Pacific Ocean, and along the coastline. The organizer of this event visited the JCC in the spring of 2016, and, inspired by the rebuilding of the Jewish community in Krakow, returned to the U.S. and created his own commemorative ride with his friends and family. Ride For The Living is an annual event under the patronage of Chief Rabbi of Poland Michael Schudrich. In addition to the Ride, there were four days of events for riders and supporters including a tour of Auschwitz-Birkenau, Krakow city tours, a trip to the Wieliczka Salt Mines, and the largest Shabbat dinner the JCC has hosted in its center to date with 260 guests. The celebrations continued the following day with the 7@nite – Night of the Synagogues Festival, organized by JDC, which began with a public Havdalah ceremony in the JCC courtyard that was attended by 1,400 people. 200,000 USD has thus far been raised by the 2016 Ride For The Living which will go towards programming for all generations, including Holocaust survivors, students, and children. Donations from the 2014 Ride supported a JCC Krakow Holocaust Survivors’ Mission to Israel. For most of these survivors, it was their first time in Israel. In 2015, participants raised over $150,000 USD to launch new educational programs and support medical and welfare services for JCC’s Holocaust survivor members. A version of this article appeared in print issue 119 of The Krakow Post. ← Krakow Music 18-21 August 2016: Festival Fever!